Cloudy with occasional rain showers. High 67F. Winds N at 15 to 25 mph. Chance of rain 50%.. Rain ending this evening. Partial clearing overnight. Low 43F. Winds NNW at 10 to 15 mph. Chance of rain 90%. It was a bit of déjà vu for the Milton High School boys tennis team last week. Are zebra mussels a concern in Lake Koshkonong? 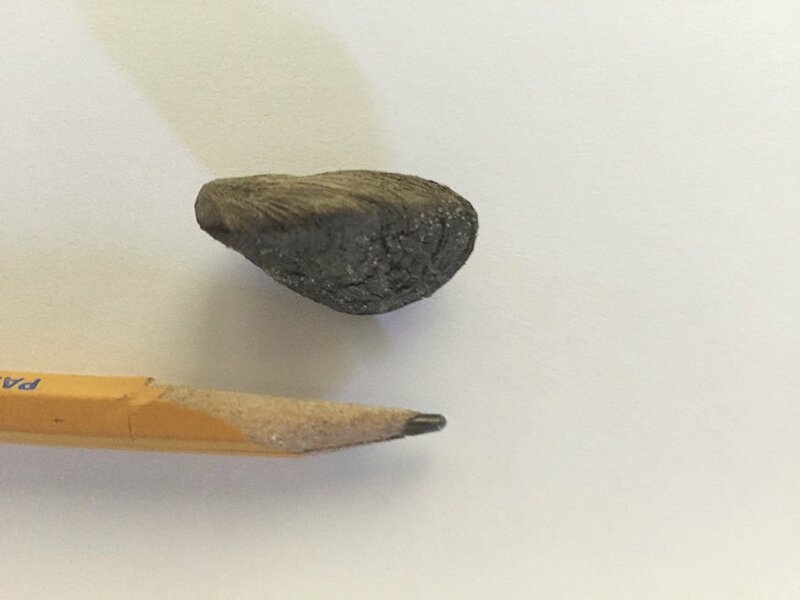 This zebra mussel, as identified by Wisconsin DNR Aquatic Ecologist Lisie Kitchel, was among several recently found on debris removed from the Indianford Dam trash racks which are located underneath the dam’s powerhouse on the upstream side. DNR records show that zebra mussels have been documented in Lake Koshkonong since 2009. Although an invasive species, zebra mussels are not foreign to many of Wisconsin’s lakes and waterways, and Lake Koshkonong is no exception. The aquatic creatures were first documented in the lake in 2009, Wisconsin Department of Natural Resources Aquatic Invasive Species Coordinator for the south central region Susan Graham said. The creatures arrived into the Great Lakes system in the mid-1980s, she said. They were identified in Rock Lake, near Lake Mills and upstream from Koshkonong, in 2005, she added. “We knew it was only a matter of time before they were in Koshkonong. They were in pretty great numbers on piers a couple of years ago.” With Indianford located just a few miles downstream along the Rock River, it was not surprising, she said, that they would be found there, too. Still, Edgerton resident George Wellenkotter was surprised, he said, when his hands became cut while helping to remove debris taken by backhoe from the Indianford Dam powerhouse trash racks last month. Upon closer inspection of the debris, he said, he saw what he believed were several zebra mussels attached to a log. After viewing photographs of one of the specimens, DNR Statewide Aquatic Ecologist Lisie Kitchel identified the creature as a zebra mussel. “People finding and reporting creatures is our best way to learn about them,” Graham said. Zebra mussels are sharp, she said. She reminded people to wear gloves while removing them. Why worry about a few zebra mussels? Graham and Kitchel both described the harmful environmental impacts caused by invasive clams and mussels, which, in Wisconsin, include zebra and Quagga mussels, described by Kitchel as close cousins, and the Asian clam. Mussels are different from clams, Kitchel said, because mussels have a “thread” which they use to attach themselves to solid surfaces. Clams do not. Invasive mussels attach themselves to native clams and mussels, encapsulating them, which stops them from eating, breathing and reproducing until they die, she said. There are over 50 species of native clams and mussels in Wisconsin, Kitchel said. “Zebra mussels will change the food web of the lake. They can encrust themselves onto crayfish and native clams causing death and could push them to extinction,” Graham said. The invasive mussels also filter water looking for food, which can alter the natural clarity of the lake, making it more clear, which, for many native species, turns out to be a problem, Graham said. “Clear water can cause an increase in nuisance (plant) growth in the lake creating a problem for navigation, so there is a cascade of effects that are not all good,” she said. While Zebra mussels have been in Lake Koshkonong for nearly 10 years, they haven’t had a dominating presence because of the characteristics of the lake, Graham said. “Zebra mussels need a firm surface to attach to and there is soft sediment in Koshkonong,” she said. Lake Koshkonong water quality is determined by the Rock River, so zebra mussels would not create clear water in Koshkonong, she added. Still, she said, the situation should be watched. Zebra mussels are still a threat to native species in the lake, and populations can fluctuate. Back at the dam, questions revolved around whether invasive mussels might attach and collect on trash racks or in gates, potentially obstructing water flow. Robert Montgomery, principal of Cambridge-based Montgomery Associates and a senior water resources engineer, and whose firm is often contracted by the Rock-Koshkonong Lake District (RKLD) on matters of hydrology, said that while so far populations of zebra mussels in the lake have been relatively small, population growth was a possibility that bore watching so that clusters of mussels did not attach to screens and clog trash racks. He said it was unlikely they would affect gates themselves. “The concern with zebra mussels is they knock out a piece of the food chain and they cover rocks on the bottom along swimming areas. The shells are sharp,” he said. The dam was cleaned and the problem was resolved, he said. Federal Energy Regulation Commission (FERC) coordinator Cheryl Laatsch also shared comments with Davis, he said, noting that the issue of zebra mussels clogging intake grates and other dam components was a “real” problem of growing concern in Wisconsin. Laatsch cited several products, such as paints and coatings used to prevent biological fouling, an industry term used to describe invasive species clogging the operating parts of dams, and other techniques used to address the problem, such as pressure washing, and steam and hot water. Biofouling products work to keep mussels from attaching, Davis said. FERC is a federal agency that regulates functioning hydroelectric dams across Wisconsin and the country, Davis said. Kitchel, too, shared concerns with Davis, he said, citing issues of clogging at hydro dams in western states where intakes placed at the bottom of reservoirs were clogged, and microscopic larvae clog sprinkler systems and the associated piping. According to Kitchel, some facilities drip chlorine near intakes to kill mussels before they attach, Davis said. Relating his conversation with Kitchel, Davis said: In Wisconsin, mussels are in the rivers, with Kitchel describing them as “quite thick” in some portions of the Mississippi. According to Kitchel, zebra mussels have attached to gates at the Prairie du Sac Dam in the Wisconsin River, where they scrape them off. In a summary of his conversation with Kitchel, Davis wrote that she had not been informed that the problem had become a “huge issue” with dams in Wisconsin. Once invasive mussels are in the water there is little that can be done about eradicating them, Graham said. DNR requires that boat owners clean their boats and trailers before leaving a launch so they don’t convey the invasive species to other water bodies. Signage is required at launches by state law to make sure boat and water vehicle owners are aware of their responsibility, she said. With 15,000 lakes in Wisconsin, DNR does not issue press releases about invasive species. Instead, the department makes sure reminder signs are in place. If mussels do become a problem at Indianford, Davis said, a protocol would be developed that might include the use of biofouling products or scraping, to keep grates within trash racks open and functioning. RKLD Chairman Steve Proud said the district had not studied issues associated with zebra mussel populations in the lake and would need to gather more information before he could comfortably comment. “RKLD does not control boat launches, and most of them are on other people’s property,” he said. The district adheres to all DNR standards and state statutes, and the dam undergoes inspections on a regular basis and is carefully monitored, he added. The RKLD website can be found at: RKLD.org.